I’ll never forget, after returning from his Builder 20 weekend in 2006, Steve announced to us that we were going to build a “green” model home. Though we weren’t really sure of all the details, we were really excited as everything came together. 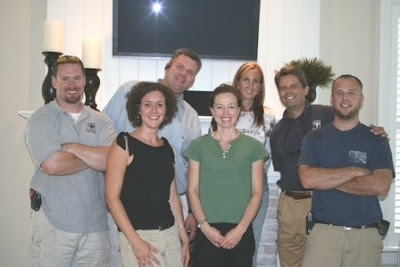 Our main purpose was to have a place where we could meet our clients to work out the details for their own custom home. All of this was created in an effort to simplify the complex custom building process for our clients. Our model was such a great asset to us, but it doesn’t stop there. . .
She was also known for her open door, to the local school board, planning meetings, book clubs, Habitat for Humanity planning and dreaming meetings and much more, but it still doesn’t stop there. . . Constant laughter she observed through the constant teasing, practical jokes and belly laughs that come from people who genuinely enjoy each others company. Great memories of birthday celebrations, Christmas dinner when everyone discovered that Amy was secretly a phenomenal cook and southern home cooked breakfasts around the dining room table. Even the serious and honest deep conversations often surfaced since we were among family. Makes you think for a moment how much more we can “model” our own home in the same way. . . a place to knock out the business of life, reach out beyond ourselves into our community and most importantly, a place to invest in and love our family who lives within our four walls.